Robin Parry has started his own blog on theological musings called "Theological Scribbles." Welcome to the blog world! He is the editor for Pasternoster, a theological press in the UK. His says that his blog is his own, not affiliated with the press he runs. Whilst I have read the enigmatic, so-called 'Gospel' of Thomas I have not read many books about it. It is most certainly a topic WAY out of my zone of knowledge. But one of the books that I did read I found to be absolutely exhilarating. It was April D. DeConnick's Recovering the Original Gospel of Thomas: A History of the Gospel and its Growth (T&T CLark, 2005). I love the sheer iconoclasm of her work. 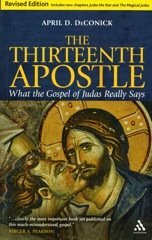 Almost everyone seems to think that Thomas was an early, non-eschatological document from a proto-Gnostic Christian group that saw Jesus in the mode of a philosophical Sage. But DeConnick says, in brief, "Rubbish! It is rooted in the mission of the early Jerusalem Church and, in its earliest versions, it was thoroughly eschatological!"